Medication is often prescribed as part of a patient's treatment for anxiety and or depression, but for a cure to be successful it must be used in conjunction with other therapies, such as cognitive behavioral therapy, complimentary and alternative therapies. Medication alone is not effective as a single cure. It is useful in helping situations become more manageable and assisting an individual to control their feelings and emotions. 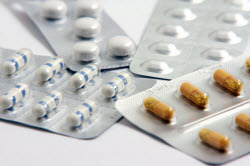 Medication might be also be used to help an individual become more receptive to other forms of therapy, for example by aiding concentration, but medication should be regarded only as an assistive and short term solution; it will not remove the causes of anxiety and depression, only help with the symptoms. Many different forms of medication are used in the treatment of anxiety but the most traditional types of anxiety medicine are tranquilizers. The most common class of these is Benzodiazepines. Some of the most well known of these are Xanax (alprazolam), Klonopin (clonazepam), Valium (diazepam) and Ativan (lorazepam). These drugs have a sedative effect, hence the term tranquilize. Brain activity is reduced and this offers relief to feelings of anxiety. They are fast acting and can bring respite to the sufferer in a matter of minutes. However, it is this numbing effect that can lead to a series of side effects, which in turn maybe as problematic as the symptoms of anxiety themselves. These effects include drowsiness or a fogginess that can interrupt normal activities such as working or driving. Others include slurred speech, dizziness, memory loss and nausea, but more importantly to note, these medications have been linked to depression. Both increased doses and long term use are thought to be responsible for depressive symptoms and suicidal thoughts. The numbing effects of Benzodiazepines block out the ability to feel pleasure as much as they block out the ability to feel pain. What is more, they can lead to dependence in a relatively short time frame. There are plenty of medications more suitable for depression than anxiety medicine, including SSRIs such Prozac, Zoloft and Paxil. These are less numbing and addictive, but still carry the risk of unpleasant side effects. Once again, they should be used in conjunction with a variety of treatments as administered by a medical professional, and the pros and cons of relief versus side effects should be carefully considered before choosing which option to go with. There are many treatments for anxiety and depression, and one of the most widely used is Cognitive Treatment or Cognitive Behavioral Therapy (CBT). Cognitive Therapy works at helping people change their thought processes, how they think about and perceive the things that may trigger feelings of anxiety and negativity. It is a popular choice of therapy on its own or alongside other therapies. More..